Do want to be the first on your block to learn how to tell fortunes from the behavior of your cat? Here’s your chance: I’ve written a book on Felidomancy, complete with a catalog guide to various behaviors and their interpretations. 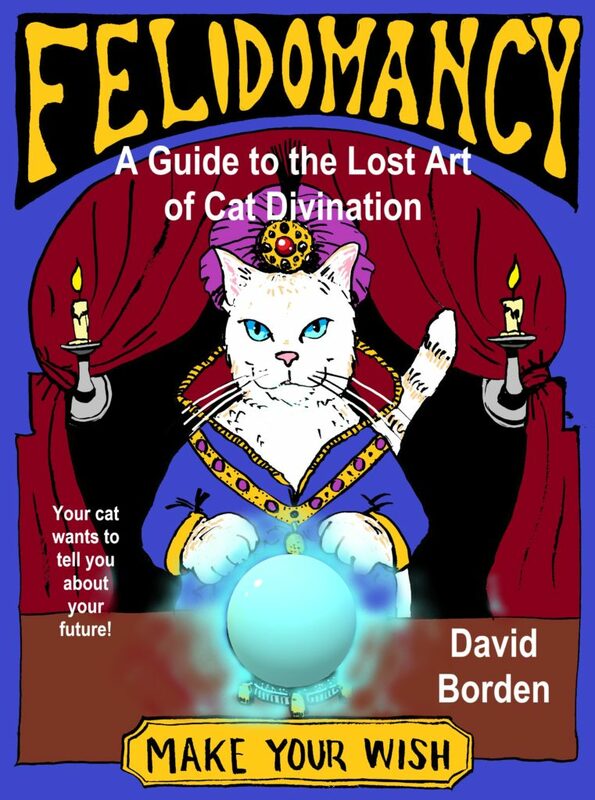 So, if you wish to tap into the lost art of cat divination in order to learn more about how to live healthier, happier, more successful life, keep reading. I’m looking for a few people to read the ebook and give me detailed feedback before its published in March. In return for your time, you get a copy of the ebook for free and your name in the acknowledgements, but more importantly, you get to help craft the final product. I am especially interested in helping me to clarify instructions, readability, and understand-ability. “This book aims to liberate your future from the tyranny of the modern, narrow view. By making the effort to connect with the divine aspect of nature, you will see the power of reorienting your thinking. The divination techniques described herein have opened the hearts and minds of countless people over the centuries. This is not “fortune-telling” from the movies. An actress isn’t reading a crystal ball and telling you what will happen. Divination is an organic process. It taps into realms of reality, potentiality, and the depth of the multi-verse, to inform, instruct, and guide—never dictate. And with this divination, you will never be alone. Your cat will be your spirit-guide the whole way. When I entered the room he just sat for a while. Next, he got up and walked to me and Meowed. After that, he walked past me. You can’t see it in the video, but he climbed up on my desk behind me and lay down again. Looking up the Behaviors in the Book of Felidomancy. Hold / focus on something you want. It is right around the corner if you let it in. An admirer (in business or love) is thinking of you –this thought should make you happy. It is time to banish a hasty, no good, harmful thought. Good riddance to it. Welcome happiness when it smiles at you. When you string all these behaviors together, you get the following: I should focus on something I want. If I maintain that focus, I should get it soon. Of course, I am focusing on something at the moment: My Oracle Card project. Next, either an admirer (in love or business) is thinking about me. Since the first behavior had to do with a project, I’m going to guess that this is a business related admirer. And, indeed that makes me happy. Lastly, what is my “hasty, no good, harmful thought?” That I’m an idiot to think anyone will help with my cat projects. I’ve got this ebook that I need beta readers for and the oracle cards. Isn’t it terrible that I’m second guessing myself? What Charlie Cat is telling me to do: chill. Don’t think about all the things that could go wrong. People are supportive. I should welcome this opportunity and let myself enjoy the happiness of this moment. If you are interested in cat divination, you should visit my Cat Divination page to learn about the White Cat Oracle Deck.